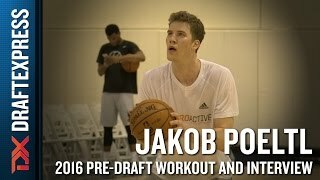 Jakob Poeltl works out in preparation for the 2016 NBA Draft in Los Angeles. Utah big man Jakob Poeltl sits down with Jonathan Givony to discuss his background coming from Austria, the type of player he is, how he sees himself fitting onto an NBA roster, the improvements he'll have to make, and much more. One of the breakout NBA prospects of last season, Jakob Poeltl emerged from relative obscurity to average 9.2 points and 6.8 rebounds over 23.3 minutes per game as a true freshman while helping Utah to a Sweet Sixteen appearance. Opting to return to school to improve his already lofty draft stock, Poeltl took a calculated risk, which appears likely to pay dividends. Adding to his resume in impressive fashion after a summer playing in exhibition games for the Austrian National Team against the talented rosters fielded by the likes of Germany, Italy, and Lithuania, Poeltl emerged as one of the most productive big men in the country, winning Pac-12 Player of the Year honors along with both the Kareem Abdul-Jabbar and Pete Newell Big Man awards, averaging 17.3 points and 9.1 rebounds over 30.5 minutes per game. Solidifying himself as a potential top-10 pick, Poeltl figures to be one of the first centers off the board come draft day thanks to the marked improvement he showed this season. Poeltl's upcoming selection in the draft will be a historic one for a number of reasons. He appears in good position to become Utah's first top-10 selection since Andrew Bogut, who was selected by the Bucks with the 1st overall selection in 2005 over a decade age. Born in Vienna, Poeltl will also become the first Austrian player to sign with an NBA team, let alone appear in a regular season game or get drafted. Emerging seemingly out of the blue as a 17 year old to average 15.3 points and 12.8 rebounds per game at the 2012 FIBA U18 Division B European Championship, Poeltl has taken one of the more unique paths to the draft of any international player in recently memory. Posting similar numbers at the 2013 edition of the same championship, Poeltl's recruitment, both from college programs and clubs in Europe, picked up dramatically as the basketball world began to take notice of his combination of size and skill. Opting to play the remainder of his pre-NCAA career in his native country, Poeltl was wrapping up his season in the Austrian 2nd Division, in relative anonymity from an NBA perspective, just three years ago. Averaging an impressive 12.7 points and 7.7 rebounds per game a year later for the Arkadia Traiskirchen Lions in the Austrian 1st Division, a league whose outcome is frequently decided by former mid-major standouts, while his fellow classmates were wrapping up their senior years of high school, Poeltl signed with Utah in 2014 to little fanfare joining a strong class that included highly regarded forwards Brekkott Chapman and Kyle Kuzma. Despite his unorthodox path to the NCAA from a country that has produced few Division I players, and being a relative unknown on the international scene, Poeltl quickly emerged as an interior presence for one of the nation's best defensive teams as a true freshman, commanding the attention of NBA decision-makers averaging almost a double-double in his first month in the college game. His improvement over that last three seasons and rise to prominence has been remarkable. Poeltl's intrigue at the NBA level starts with his impressive combination of size and athleticism. Measured at 7'1 in shoes with just a 7'1 wingspan and a 242-pound frame, Poeltl doesn't have great length relative to his height and will need to continue to add weight to his frame, particularly his lower body. Nevertheless, he's a fluid athlete with better mobility than most players his size. He lacks a degree of explosiveness off two feet, but in general, has a very promising combination of physical tools for a center prospect. The talented big man made excellent use of those tools in a significant offensive role this season, as he finished the year among only a half dozen players in high major conferences scoring over 1.1 points per possession on 14 or more possessions per game. Pouring in a spectacular 1.15 points per possession over 14.8 possessions per game, up from a very efficient 1.03 over 8.9 per game as a freshman, Poeltl showed marked improvement on the offensive end, ranking among the most prolific and efficient scorers in the Pac-12 as Larry Krystowiak made Poeltl a priority in Utah's offense. Doing the majority of his scoring one-on-one on the block, the talented Austrian big man's size, footwork, and efficient approach allowed him to make a consistent impact in the scoring column, including a handful of strong performances against quality competition. Finishing the year ranked fifteenth in the country in post-up scoring, and third in efficiency, while shooting 59% going one-on-one on the block according to Synergy Sports Technology, Poeltl combines solid footwork with simple, but effective moves inside. Able to score on hook shots using both hands with nice touch and mixing in an occasional up and under, Poeltl's post repertoire isn't particularly advanced and he clearly prefers to operate over his left shoulder. He showed marked improvement as a passer from the block as his turnover rate plummeted while he ranked among the most productive passers from the block in the country, particularly when faced with a double team, as he showed far better vision and patience than he did as a freshman. At this stage, Poeltl doesn't project to be a dominant interior scorer at the next level, especially with the way the NBA game is trending. He does, however, figure to be a threat to score with his back to the basket at the next level in spots, and his improved feel for moving the ball could make the team that drafts him more comfortable getting him touches in their offense early on. Poeltl's role at the next level early on will likely revolve heavily around his ability to finish the shots created for him. Shooting a sensational 69% finishing around the basket in the half court, he proved very effective converting cuts and put backs, but especially rolls to the rim and transition opportunities throughout the year, as his size and consistent energy shined at times. He plays above the rim when he can build a head of steam, shields the ball with his body fairly effectively, pivots to daylight well, and even flashes the ability to use his dribble to attack the rim driving either direction when he catches in the midrange area with room to operate. Not overly bouncy in traffic, the 20 year old center occasionally struggled at times to finish over long, physical defenders last season as he plays a bit high and, though he has excellent touch, doesn't finish quite as emphatically or as explosively as one might hope off of two feet. It will be interesting to see what kind of strides Poeltl can make in a NBA strength and conditioning program as any improvements he makes athletically or in terms of strength could pay significant dividends. Attempting only a half dozen shots from any significant distance away the rim over the last two years, Poeltl is not a particularly dangerous weapon outside the paint at this stage. He shows the ability to make sound decisions with the ball on short rolls to the rim and reads in hand off situations, but he isn't a very versatile offensive player. He made massive strides as a free throw shooter this season, upping his percentage from a dismal 43% to a very serviceable 69% as a sophomore, and made a few jump shots in national team play last summer, but it remains to be seen if Poeltl's skill level away from the rim will evolve into an asset for him down the road. A highly efficient offensive player who did plenty of scoring when plays were not called for him over the last two years, there's an obvious role for Poeltl at the next level. The question is whether his trajectory over those two seasons continues and he becomes a more dynamic player on the offensive end early in his NBA career, and whether his effectiveness as a finisher translates as smoothly as the team selecting him will surely hope. He was terrific at times last season putting up big scoring numbers with outstanding efficiency, but was also quite quiet some nights as well, notably in Utah's NCAA Tournament loss to Gonzaga where he looked gassed as the physical, aggressive, but smaller Domantas Sabonis got the better of him, recording 19 points and 10 rebounds to Poeltl's 5 points and 4 boards. Outside of his ability to score the ball, Poeltl does a solid, but not spectacular job of crashing the boards. His instincts and motor are solid, but he lacks the tremendous length and athleticism common among the game's top rebounders. Averaging 12.1 rebounds per-40 minutes pace adjusted, Poeltl ranks 12th among players in our top-100. Defensively, the 7'1 center provides some rim protection, but his lack of length and elite explosiveness limits him in that regard as well as he ranks just 15th in blocks per-40 minutes pace adjusted among that same group. Despite his shortcomings in that aspect of the game, there's otherwise a lot to like about Poeltl defensively. He's competitive and moves his feet well, which shined at times when he was switched onto smaller players in the pick and roll. He lacks a degree of strength and toughness on the block, but stays in good position and is quite a bit more disciplined not leaving his feet and avoiding foul trouble than many college big men. Though Poeltl may not grow into the type of player that carries a team defensively, he could certainly hold his own assuming his frame improves, without taking a toll on his foot speed. A likely top-10 pick, Poeltl is a player a number of college programs elected to pass on just a few years ago. His improbable, rapid ascension through the NCAA ranks has been fascinating to watch, as few prospects in recent memory, particularly at the college level, have followed such an unusual path to the NBA. It is truly rare, at this point in history, for a player of any background to appear on the NBA radar as unexpectedly as Poeltl did. Though he lacks a degree of long-term upside, his relative youth and development in recent years fuel hopes that he could emerge as a valuable, role-playing center who can make contributions on both ends of the floor. From a cultural perspective, Poeltl's significance to the game of basketball in his native Austria, a nation whose population is similar to that of New York City, can't be understated. His success in the NBA could go a long way towards changing the hoops landscape in the landlocked central European nation. Analyzing how Utah's Jakob Poeltl and Arizona's Kaleb Tarczewski fared in their head to head matchup in Salt Lake City last week. This was a good game to evaluate the 7'1, 20-year old Poeltl in, as it was one of just a handful all season where he'll actually be matched up with another player his size. The 7-foot, 23-year old Tarczewski is one of the most physically mature players you'll find at the college level and is a handful for any big man to go up against with his ripped frame and high activity level. We only looked at possessions where the two were directly matched up head to head. Poeltl didn't make any drastic improvements since his freshman year at Utah, but his sheer size and defensive presence jumped out to NBA scouts and media members alike at Nike Academy. Poeltl continues to fill out his very solid 7' 1 frame and proved himself as one of the best defensive big men in the 2016 NBA Draft. Not only does Poeltl show excellent timing and instincts as a shot blocker despite measuring only a 7 1 wingspan, he's developed into a tremendous post defender who plays with toughness and grit on the interior. The Austrian big man pushes opposing bigs on the block and very rarely allows a deep seal in the paint. Poeltl can be a bit foul prone, but he's doing a better job staying down on fakes and using his size to alter shots inside. Poeltl also stood out as a pick and roll defender, keeping the ball contained and recovering to his man quickly while also switching occasional ball screens and staying with the ball valiantly. On one play in particular athletic Indiana wing Troy Williams forced the pick and roll switch and backed the ball out, preparing to isolate Poeltl and either get to the rim or pull up for a jumper. Poeltl stayed step for step with the quicker Williams, and eventually swatted his layup attempt off the glass. Poeltl still has some room to improve as a defensive rebounder but overall he was fantastic on the defensive end. Offensively, Poeltl was more or less the same player we saw at Utah last year. Everything was 10 feet and in, with the majority of his buckets coming on rim runs, offensive rebounds and pick and roll finishes. Poeltl made one jump hook and did have a couple of deep catches and finishes versus mismatches, but he hasn't appeared to have made any major strides as a jump shooter or interior scorer. It will be interesting to see how effective Poeltl can be on the offensive end without Delon Wright, who played a big part in the 7-footer's offensive success last year by feeding him pick and roll pocket passes and drop offs around the rim game in and game out. Still only 19 years old without a great deal of experience, Poeltl has time to develop his offensive game, and the fact that he already brings so much value on the defensive end makes him a very intriguing option in the lottery of the 2016 NBA Draft. Take a look at our video section for a compilation of all the videos we've produced this year.